1. The Zvezda Ka-27PS Helix-D SAR, #7247, first announced over two years ago, has been released in Russia and should be generally available very soon. 2. There is a new 1:48 resin kit of the Robinson R-22 Mariner from Legato, #LK4809, which will no doubt be very similar to their recent (and very nice) R-22B, but with the addition of the floats. It is available from Modelimex. 4. Some new Model Alliance decals are being advertised in the modelling press, but aren't quite ready yet. First will be the CAF CH-146 in its new yellow & red SAR markings, along with a black anniversary scheme for the same type. Next will be an RAF Chinook sheet, this will include both original schemes, Gulf War, IFOR/SFOR & KFOR markings and Iraq Freedom nose art. British Military Chopper decals Parts 1 & 2. A mixed bag including Merlin, Dolphin, Gazelle, Puma, Wessex, Squirrel, Griffon, S-76, Sea King, etc. These will include comprehensive stencils (especially for the 1:35 & 1:48 Yanshuf 2) & instruction booklets with photographs. 6. 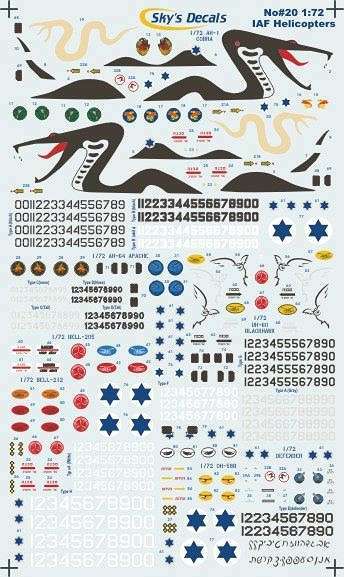 Maxdecals have re-iterated their intention to release some new decal sheets this summer. We are assured that the next helicopter subjects will be an 1:72 Irish Air Corps sheet featuring a number of aircraft including the Garda EC-135 and AS355 Squirrel, plus markings for the Irish Coastguard S-61N's and a 1:48 Dauphin. The second sheet will be the long awaited Antarctic Helicopters sheet in 1:72 featuring machines from VXE-6, Bell 212 from Uruguay and many others as listed previously. Joe Maxwell would like to remind readers that suggestions for future helicopter decals are always welcome. Thanks to Petr Kovar (Modelimex), Gary Madgwick (Model Alliance), and Joe Maxwell (Maxdecals).